The Seattle Times ran an important front page article today on the current election in the Seattle Education Association (SEA), “Politics plays role in teachers union vote for president”. I am running for President of SEA on the RESPECT ticket, a slate of social justice educators. The main criticism of our campaign cited in the article is that we have too many endorsements from outside the union–which only highlights how much support we have in the community and among social justice advocates. 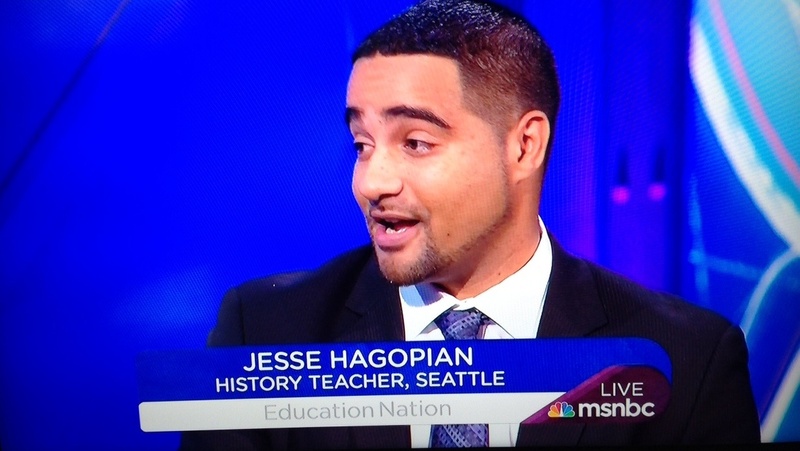 It should also be noted that we have scores of endorsements from leading educators in schools across Seattle. The most important part of the article is the end where the difference between our two campaigns is driven home when it is revealed that the incumbent leadership is endorsed by the pro-charter school/pro-standardized testing, Gates Foundation-backed reformer organization, Teachers United. Of course, Teachers United has a right to express their ideas in a fair and open debate. However, if the vast majority of the union membership believes that corporate reform policies of privatizing education and reducing teaching and learning to a test scores is harmful to public education–as we have expressed in numerous votes in the SEA–then we need a union that more rigorously opposes these harmful policies. I would have liked to see more information in the article about our entire slate of candidates on the RESPECT ticket–including the great Marian Wagner, running for Vice President, and Dan Troccoli, running for Treasurer. I would have also liked to have seen a more substantive discussion of the political points that are being debated in this election. Most notably absent from the article was our criticism of the contract that SEA negotiated with the District that made far too many concessions for educators–such as not getting caseload caps for our counselors and allowing Seattle to become the only city in Washington state to allow two measures of “student growth” (including state test scores) in teacher evaluations. Finally, I would have liked to have seen some of the points of the SEE RESPECT platform highlighted, such as our dedication to combating institutional racism by advocating for a restorative justice approach to discipline replacing zero tolerance polices that have resulted in dramatically disproportion discipline used to punishing African American students. Still, the article raises the important issues of school closures and the over use of standardized testing–and pointed out that these are movements I have been a part of for many years. Because these are issues that educators in Seattle care deeply about, this article should help to increase voter turnout in the election–a prerequisite to a an engaged and activated membership, one of the primary objectives of ours in the campaign. Those of us on the SEE RESPECT ticket in the election know that our union needs to become more powerful in its defense of public education. 1) Sharing our campaign with every educator you know–on Facebook, Twitter, email, and beyond. 3) Remind a Seattle educator to vote before Wednesday, May 7th.